Today is definitely a Yay Day kind of day. First of all, Tristan’s follow-up with Dr House at the children’s hospital went extremely well yesterday. Although Tristan panicked a little bit when he figured out that the doctors were planning on actually removing his ugly little mole, instead of simply poking at it and annoying the snot out of him, he toughed it out in a way that made me proud and a little bit sad at the same time. Five year olds shouldn’t try so hard to be brave, yanno? Anyway, although I was a little freaked out by it, Tristan’s favourite part of the whole experience was seeing the excised mole floating in a small container of some sort of fluid, ready to be sent off for biopsy. “It’s like a part of my body went swimming without me!” he told me later in the car with obvious delight. I shuddered, but he recounted the story with glee many times throughout the day, so I guess – as usual – the residual trauma is mine and mine alone. But the extend of my ebullience today arises not from relief in having the dermatalogical stuff taken care of once and for all, but from sheer narcissism. It is, after all, all about me. Between the back fat and the weather’s schizophrenic fluctuations this month and the fact that even the mat clothes that I do have seem to be either too big or too small or too hot or too casual, every single day for the last couple of weeks I’ve stood in my closet in the morning and sighed because, even on a day when everything is clean and all possibilities are open to me, I have nothing to wear. And that would get me thinking about all the great maternity clothes that I used to have, and I would feel bitter and pissy in addition to fat and sloppy and generally unattractive. Not a great way to start every day. Beloved, bless his understanding heart and huge sense of self-preservation, encouraged me to go shopping. And so I did, but even after giving myself free reign in the mall and dropping the best part of $200 I still ended up with only two pairs of pants, one of which I’m not convinced I like, and two colours of the same sweater. Add ‘disheartened’ to bitter and pissy and fat and sloppy and generally unattractive. But then yesterday… yesterday! I had dropped Tristan off at home after his appointment and had 30 minutes to kill before I could pick up Beloved. In a flash of inspiration, I thought I’d check out Boomerang Kids, a consignment store in Westboro. Now, I know through previous experience that in the maternity consignment stores, on a good day and with a little luck you might find one or two pieces you like, but peeps, I’m telling you: I hit the motherlode. I swear, I’ve never seen so many clothes that so suited me outside my own closet. And they FIT! I was nearly weeping by the time I ran out of the changeroom, 15 minutes late to meet Beloved but positively exhilarated by my purchases. Two sweaters for winter, two or three button-down blouses, a cardigan, another couple of tops, and the one thing that I was most bitter about losing before: a pair of denim overalls that both fit over my belly and didn’t ride up ridiculously short in the leg. For $12.99!! The whole deal cost me just under $100 before tax, and suddenly my wardrobe is complete. I honestly don’t think I’ll have to buy another thing, AND I can return the “meh” pants that cost me $59.99 the day before at the maternity store. 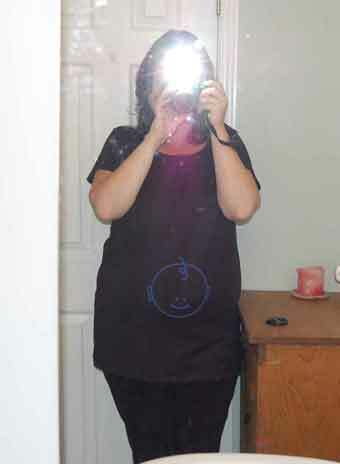 Is this not The Most Adorable Maternity T-Shirt Ever??? (And, possibly the worst self-portrait ever? Sorry about that!) The t-shirt was designed by my friend, the brilliant and creative mind behind Lee’s Things. You can get yer own adorable maternity t-shirt (it was a tough choice between this one and the ‘baby loves chocolate’ one! ), along with some other really clever and cute designs on onsies and bibs and even tote bags, from her cafe-press store. Tristan’s mole excised without trauma, and anxiety over the pending appointment absolved. A reinvigorated and rejuvenated wardrobe. CHEAP! Yep, it’s a good day here. Now, in the great tradition of Yay Day, tell us what’s making you happy today. I’m happy for you that you had a great YAY day! Maybe you could send some of that positive karma my way…. Love the cute mat shirt! Way to go with finding some good clothes. I pretty much hate everything in my closet right now, so the thought of finding some good clothes (at excellent prices) is inspiring me to go shopping. Hmm… since our water *is* shut off and everything here, perhaps I’ll treat the Peanut to a lunch out and some shopping with mummy? What a day! Great to hear the little one did well at CHEO. I love Boomerrang – glad you found some great steals. Good job on the deals. It’s heart-wrenching to pay 60$ for a pair of pants that you will maybe wear 10 times. I know just how you feel about clothes. I used to merely dress like a nerd, but since having babies I dress like a homeless person. It’s really not a good look for me. Good for you and your resilient boy! My yay for today is 6, count’em 6, comments on a post – the most I’ve ever received. I’ve got the link post ready (finally) and it will generate some traffic to others (I hope) and then I will be sharing the yay day. As for Tristan, one of those typical 5 year old boys who really try oh, so hard ot be brave…doesn’t it just melt your heart? I love Yay Days. In fact, I think I love your Yay Days better than my own! My yay for the day is that you found that fantastic shirt. i just wish i would have had that shirt all the times I was preggo! My biggest yay of the month had to have been my first comment on my blog! A day late, but I had to add… I hate back fat! Why is my backside gaining more weight then my tummy? Shouldn’t it be the other way around… sigh… very annoying…. and I’m sick of maternity pants that keep falling down and sick of mat clothes and waddling around in general! And I still have 3 months to go! LOL! Yay day… because my son is the love of my life, and I got to spend 2 days at playgroup with him and just loved seeing him in action, so happy and wonderful. Yay day… because my low placenta is on the rise, according to today’s u/s. 😉 (I am getting more frequent u/s’s to make sure this baby boy doesn’t have hydronephrosis). Happy to hear you found some great mat clothes! Delighted that you got multiple presents! Tickled with the linky love! Wear the shirt in good health!